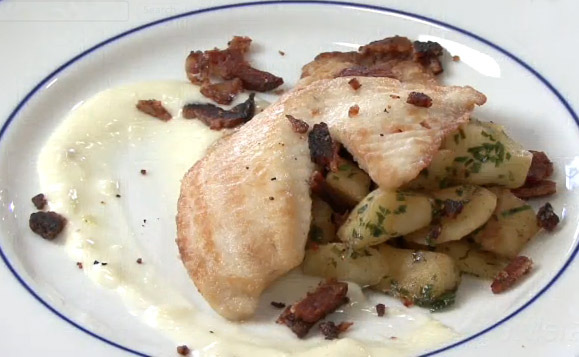 How to make Tilapia with Garlic Mayonnaise and Parsnips? * 1 bunch flat leaf parsley, finely chopped. Add the garlic, lemon juice, egg yolk, and one tablespoon of water to a blender; and season with kosher salt (to taste). Turn the blender on low speed. While the blender is on slowly add oil to the contents. When the garlic, lemon juice, egg yolk, and water are thoroughly combined, pour the contents into a small bowl, and set aside until ready to plate. Next, you melt the butter in a pan over medium-high heat. Add the parsnips to the pan, and let the parsnips saute in the butter for several minutes until they begin to brown. Add a touch of balsamic vinegar and salt (to taste), and cook down for approximately two minutes. Add one more tablespoon of butter and chopped parsley, and melt. Toss the contents well, and set aside until you are ready to plate. Brine the tilapia fillets by adding one quart of cold water, two tablespoons of salt, and one tablespoon of sugar to a large bowl. Place the filets in the bowl and let sit for seven minutes. Pat the tilapia dry, coat them in flour. Add a small amount of oil to the pan, and heat over medium-high heat. Fry the tilapia for about two minutes, then flip and turn off the heat. (The fish will continue to cook in the hot pan). Set the tilapia aside until you are ready to plate. Slice the bacon into small bits before you cook. You can do this before or after you prepare the bacon. I prefer to do it before cooking because I find it easier, but it is your choice. You are the chef! Cook over medium heat stirring occasionally until the bacon is finished cooking. Place a paper towel on a plate and use your spatula to remove the bacon from the pan and onto the plate. This is optional, but the paper towel helps in soaking up all the excess grease from the bacon. Set your bacon aside until you are ready to plate the dish. Place the Parsnips first onto the plate. Place the cooked tilapia on top of the cooked parsnips. Then, spread your garlic mayonnaise around the side of the plate. Crumble the cooked bacon over top. Once you have finished plating, serve immediately. Enjoy your tilapia with garlic mayonnaise and parsnips! After dinner, you will feel recharged and ready for the next Clash of Clans battle! Liv is a food lover. After living on her own for 5 years, she has learned to cook meals for herself and her guests. She improvizes recipes that she found online and adds her own twist to them. How to Make Artichoke & Mushroom Frittata?